I bought a Nintendo Switch over the New Year’s holiday. I’ve picked up three games since then, but other than a weekend spent playing Mario Kart 8 with my brother in St. Louis, I have only been putting time into Legend of Zelda: Breath of the Wild. There is so much joy in this game. In every single detail. The weather, the terrain, the puzzles, the atmospheric music, the voice acting, the anime-like storyline. So much joy that it has outweighed the slight guilt I feel at cheating. In my defense, a friend from college who has two young sons noted on Facebook that the game is “imposiburu” without using online guides. Also in my defense, I just don’t have time to figure out everything. I’ve done most of it on my own, but I have used the guides so I don’t miss things here or there or to save myself some time. These guides, as I mention in the article, are called 攻略 (kōryaku, walkthroughs), and I’ll let you find them yourself. Finding what you need (or what you want to say) in a foreign language is always good practice. Fortunately, Japanese walkthroughs don’t seem to be the ASCII-laden tomes I remember from the early days of the internets. Even the English walkthroughs these days are more visual and presented in marked up hypertext for ease of browsing. I think I’m about 60-75% through the main quest in Breath of the Wild, but I have plenty of stuff left to smoke out in terms of side quests and whatnot. I’m kind of in a holding pattern right now, squeezing a little more juice out of the fruit before I start to make more progress on the last leg of the main story. I don’t want it to end. It’s been fun to play in Japanese. I’ve been running into some of the video game lingo I used to encounter more regularly at my old job. 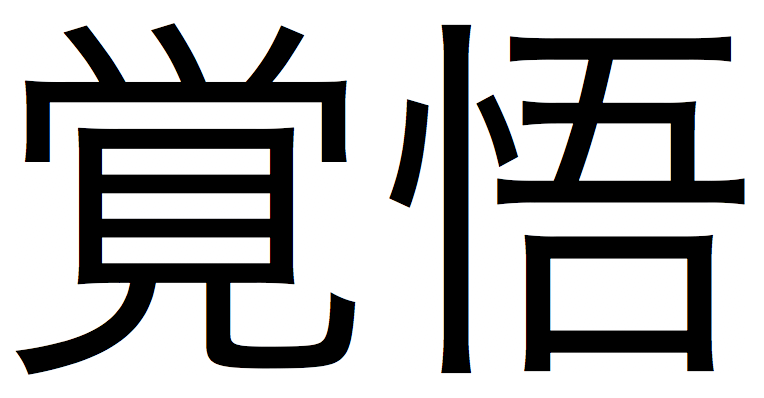 One of these is 覚悟 (kakugo, readiness/preparedness/resolution/resignation). This was a pretty funny part of the game, and I won’t spoil more than that, but as you may or may not be able to tell, this is immediately before you fight this guy. 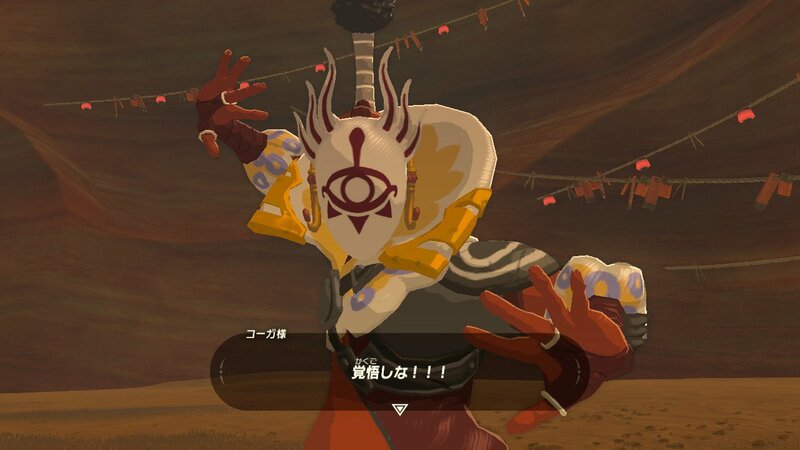 He’s telling Link to “prepare yourself” with 覚悟 and しな (shi na), which is a short, impolite version of Xしなさい (X shi nasai, do X). So…are you, punk? 覚悟できているのか？ (Kakugo dekite iru no ka). Get ye to a Nintendo Switchery! Get ye to Hyrule! This game is too good to miss.